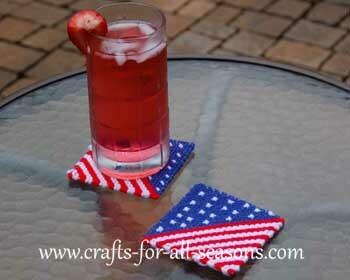 These American flag coasters are a creative craft to add some patriotic flair around the house this summer. 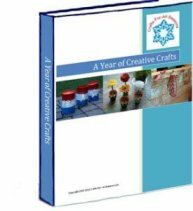 They make wonderful gifts, and tend to sell well at summer craft bazaars. This is what I call a "relaxing" craft, and once you get the hang of it you will be able to whip a set of these up very quickly, while watching TV! 1. This is made using a simple backstitch. A close up of the pattern is shown below. 2. 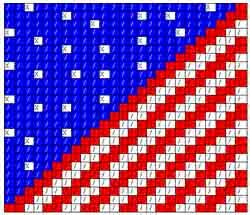 Begin the American flag coasters by cutting out a square from the plastic canvas, 25 squares long on each side. 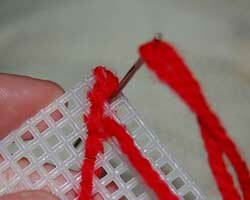 Thread your needle with the red yarn. 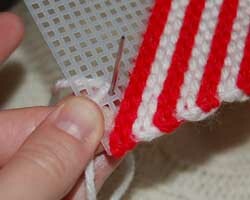 It is best to keep the yarn a length that is long, but still easy to work with. 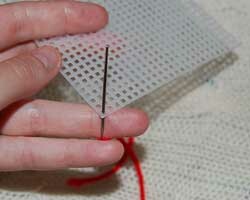 Begin by threading the needle up through the canvas at one of the corner squares, as shown. Pull the yarn through but leave a little tail of yarn hanging from the back. This will eventually be "grabbed" by the other yarn as you stitch so it will be anchored. 3. Next, bring the needle around the corner and back underneath the canvas. 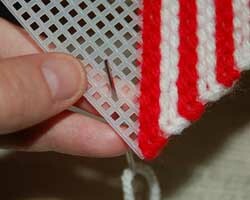 Bring the needle up through the next diagonal hole, as shown. 4. 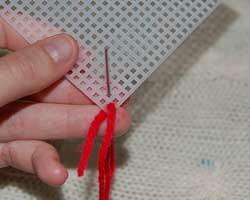 You finish the stitch by bringing the needle down through the first hole in the corner again. 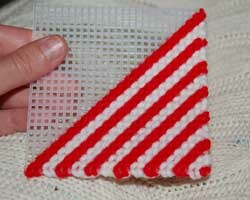 This is called a backstitch, and it makes a little diagonal line. 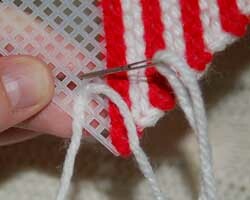 Continue making these stitches, by bringing the needle up through the third hole from the corner, and repeating. 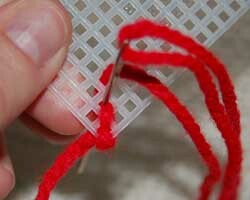 Keep stitching until you have a red diagonal line up to the opposite corner of the coaster. HINT: If you run out of yarn, re thread your needle and begin again, always leaving a little tail dangling from underneath the canvas. 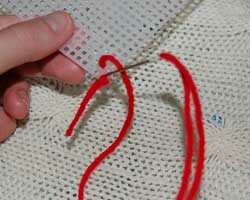 As you work, try to make sure you anchor these "tails" by stitching them underneath your new stitches. 5. 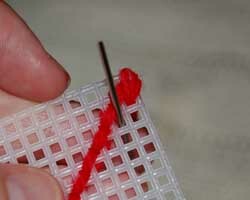 When you reach the opposite corner, stitch around the corner and begin stitching another row of red, right next to the first. 6. Once you have a diagonal stripe two rows thick, skip two more diagonal rows (which will be for the white yarn) and begin another two rows of red. Continue this way until half of the coaster is done. 8. 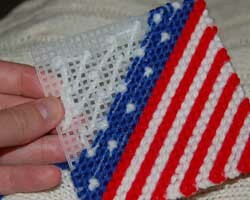 Continue with the American flag coasters by stitching the white stars next. The stars are made using a simple cross-stitch, which looks like an "X" in the canvas. Begin the first star two rows from the middle red stripe. Space the stars two diagonal squares apart. Refer to the pattern at the top of the page if you need help. 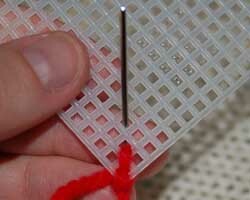 Look at the images below closely to show how the cross-stitch is done. 9. 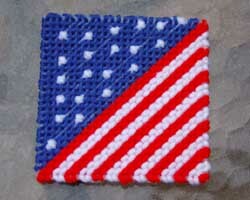 Finish up the American flag coasters craft by stitching on the blue. 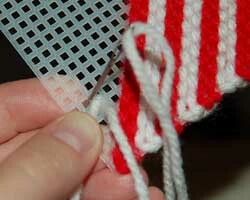 Use the backstitch, as described above. Skip over the stitched areas where the stars are.